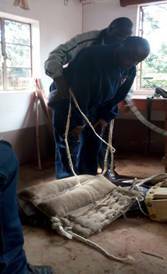 The materials include; Dumped polythene, paper, dried soft grass, wood, wood shavings, banana leaves, old tyres of motorbikes and vehicles, old clothes, blankets and bed sheets, plastic bottles, feathery materials and other soft dried fiber, ropes. 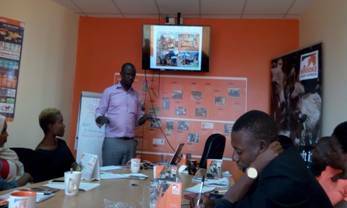 8th, November, 2017 at Brooke East Africa in Kenya; Dr. Vincent Oloo training our team about the philosophy and activities of Brooke East Africa, donkey welfare concerns in Kenya and challenges in implementing these activities. 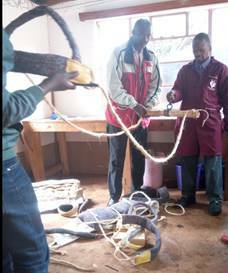 LEFT: 7th, November, 2017 at The Donkey Sanctuary Kenya; our team was trained in making Harnesses from cheap recycled materials including blankets, ropes, among others. 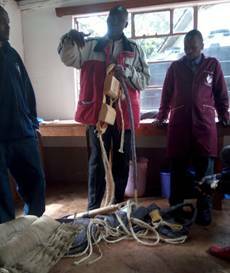 The training also included practical use of these harnesses to prevent injuries and wounds to donkeys MIDDLE: 8th, November, 2017 at Brooke East Africa in Kenya; Dr. Vincent Oloo training our team about the philosophy and activities of Brooke East Africa, donkey welfare concerns in Kenya and challenges in implementing these activities. 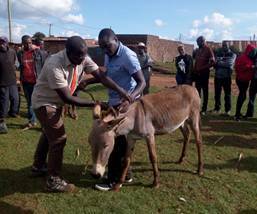 RIGHT: 9th, November, 2017; Dr. Vincent Oloo training our team on handling donkeys, making a good head halter and donkey behavior. Donkeys in Uganda are mainly kept in North Eastern Uganda where the road network is so poor and thus they offer a cheap alternative means of transport. The districts with a lot of donkeys in the country include Kapchorwa, Kween, Bukwo and Amudat. Donkeys are estimated to be approximately 8000 in the above 4 districts. Denied treatment. Donkeys are thought to be very resistant to diseases and thus some people ignore them to recover on their own when they get infected. This not only causes suffering but also death of some sick donkeys that are left un treated.Over working and overloading of donkeys. This is a very common practice in all donkey keeping communities in Uganda. Some people believe donkeys have no working limits. Donkeys are given or allowed access to little grass/feed. People tend to give more care to other livestock than donkeys that are considered work animals. In most cases good grass is preserved for cattle and the bad/hard one is left for donkeys. some people even deny donkeys drinking water at homes since they are thought to have drunk at the wells when fetchingWounds. 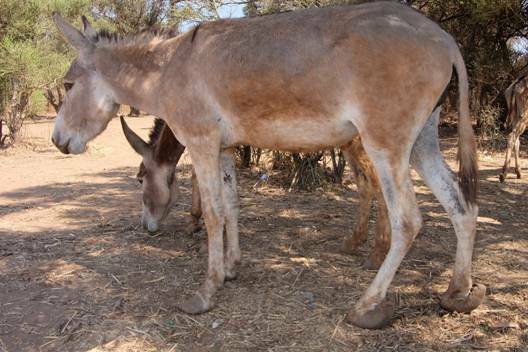 Majority of working donkeys in Kapchorwa have wounds around the tail due to lack of or poor harnessing materials used. Poor method of slaughtering donkeys. Donkeys are hit many times on the head using tree logs before they are slaughtered when they are uncouncious. The hitting causes alot of pain and suffering to the donkey. This practice is carried out on almost every market day in Namalusubcounty, Nakapiripirit district.Thefty. 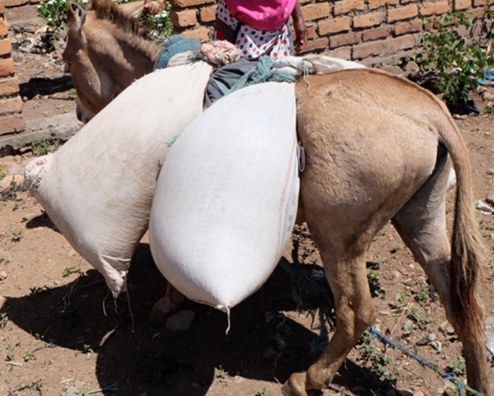 Stealing of donkeys for slaughter is still a common challenge in donkey keeping communities. Stolen donkeys are slaughtered in order to obtain skins from them which are considered to be of a high price value. Permanent residence : For many years , we have not been having our own buildings instead because of our good work , the department of animal health at Iganga offered to accommodate us but the space is very small owing to the challenges of many animals brought for our care and the organizations other activities. We therefore need land even 1 acre is enough for the start to construct our official clinic.We can have a training block for the training program especially for cpd and for the communities. Rescue: We have a program to rescue and provide homes to homeless dogs and cats and other homeless animals, be able to provide essential requirements like food as they a wait for permanent homes. Treatments: Antibiotics , Antihelminths , Pour-ons for treating mange and ticks on dogs and cats esp. It is thus incumbent upon veterinary and veterinary para-professionals and their employers to seek and refresh, develop their knowledge and skills on an ongoing basis to maintain an acceptable standard of professional practice and competence. This can be done through Continuous Professional Development (CPD) documented as a process by which veterinarians acquire, maintain and enhance skills and knowledge with which all practicing veterinarians need to meet the requirements of the Veterinary Council’s CPD framework by undertaking activities relevant to their area of practice. While this is advocated for internationally; some countries have already put processes in place and started while others are in developing stage. As we talk, Uganda is already in process. The Uganda National Household Survey 2016/17 estimates the population of the country at 37.7 million persons with 75.5% being rural based with the population growing at an average rate of 3.0% per annum. National poverty levels stand at 19.7% with high levels of poverty more prevalent in rural areas. Poverty is highest and more prevalent in the Northern and Eastern Regions of Uganda. The agriculture sector (where livestock belongs) contributes to 23.5% of the Gross Domestic Product (GDP) with livestock growth at an average of 2.5% per annum but less than that of human population growth. Livestock /animal keeping is popular in the country for economic purposes and need to be encouraged since 52% of all households in the country keep livestock albeit such stakeholders being poor. Livestock products in rural areas contribute to 18% of incomes for households while it contributes to 12% in urban areas. Livestock in Uganda from an IGAD report was re-evaluated and its GDP contribution rose from 1.7% to 3.2% with a real value of 526 Million US$ Dollars. Inadequate animal welfare in Uganda predisposes to disease which is attributed to causing the loss of an estimated 86.3 Million US $ per year in the livestock sub-sector. Therefore - animal welfare and health especially as regards inadequate:training, inputs and outreach services in livestock is a major challenge. Animal welfare requires national strategic address to enable sustainable improvements in animal health, animal production, food security and livelihoods for the ever increasing human populations as we target the Uganda Vision 2040 to enable households to move from poverty to prosperity as also required by UN-SDA/SDGs, the OIE and the African Union. Donkeys, horses, camels (2018 from DVOs): about 0.08 Million while other estimates vary between 0.03 – 0.5 million. There are also nearly 1millioncolonized bee hives for honey – wax - royal jerry and bee venom among others. Bees also require attention for their welfare to enable survival and production. While most cattle, goats, sheep, chicken and donkeys are raised in various Regions where the cattle corridor pass by virtue of semi-aridity of these areas especially in dry periods; livestock including pigs and donkeys are also raised in the two non-cattle corridor areas (with milder and better climate) (Figure 1). The semi-arid parts of the cattle corridor largely use pastoralism and communal livestock keeping. Bee keeping is in all areas in Uganda. Livestock in the non-cattle corridor areas are generally fewer per holding and slightly better cared for in terms of: disease control, feeds and watering problems. In general – Uganda’s livestock resource is at high risk of less production due to constraints in providing them with conducive animal welfare requirements such as: training of veterinary and para-veterinary professionals and other stakeholders in addition to other farm inputs, technical logistics and outreach services. Fish in ponds are part of domesticated animals and have related animal welfare challenges including pollution. Uganda also has a high wildlife resource as fish and reptiles in the many lakes and rivers as not protected areas but regulated as applicable. It also has fish, reptiles and terrestrial wild animals in the 28 listed Protected Wildlife Areas covering different parts of the country excluding zoos. These wild animals are also challenged and thus require related animal welfare services / care and handling like in livestock to perform well in their expected outputs. Veterinary human resource in Uganda was originally used as government workers before 1993 – 1997 policy reforms that saw divestiture – liberalization – privatization and decentralization of especially the grass root veterinary extension services. Such services had earlier provided public animal welfare and health services to the majority poor households. After the reforms; most of these systematic services including the training of veterinary and Para-veterinary professionals collapsed leaving majority poor and rural based farmers stuck. It is no wonder then that the mal-functioning of the public good veterinary services /regulatory in the country in animal welfare – animal health – veterinary public . health and food safety has leads to an estimated loss of 86.3 Million US$ per year attributed to diseases in animals in Uganda. More than 3700as official estimates of Para-vets in 2018. There are about 6 Higher Institutions training para-vets and outputting many per year on the market but with inadequate knowledge – skills – competences in systematic animal welfare and health. 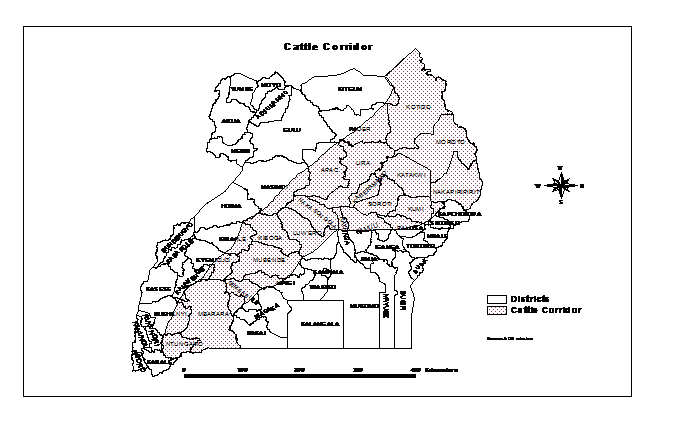 Figure 1: Map of Uganda showing the central shaded area called the Cattle Corridor where livestock is concentrated in its keeping largely using pastoral and communal farming as you head northwards. The cattle corridor area(Figure 1) is semi-arid in dry periods while the left and right sides of the corridor are more agriculturally conducive. The central and southern parts of the cattle corridor and areas outside the cattle corridor mainly keep livestock using communal grazing, extensive, intensive and peri-urban farming methods. Animals just like us human beings have feelings thus called sentient. With the ability to have feelings; animals thus have physical and psychological needs to be addressed by their owners and or communities in which they are raised. These needs and requirements related to animal husbandry and health are also called animal freedoms. When animal freedoms are given or addressed; they enable animals to survive in nature leading to bio-diversity, attainment of optimum health leading animals to give maximum outputs in their various specialized areas of rearing as related to sustainable household livelihoods. When the 5 Animal Freedoms (5F) below are provided; the animals are said to be in a good state of animal welfare or animal wellbeing. When the 5Fs are provided, their owners or communities are also said to be compassionate – kind – loving and humane to animals. When this is achieved; animals are said not to experience unnecessary pain and suffering; are healthy; output more and qualitative / safe products and provide higher livelihoods for their owners / communities. Animal welfare is actually the building blocks required to attain good animal: health, production and sustainable income earnings by households who depend on animals .Most veterinary professionals, para-veterinary professionals, farmers and other livestock industry value chain stakeholders have inadequate knowledge – skills and competences in the area of animal welfare as a basis for animal health – animal production and sustainable household incomes. Freedom from fear and distress by ensuring conditions and treatment which avoid mental cruelty and suffering. Animals in emergency situations of: earthquakes, floods, mudslide, civil disturbances; droughts; epidemics among others. Institutions in Uganda mandated or which are responsible for ensuring animal welfare and protection to prevent unnecessary pain and suffering. The Ministry of Agriculture, Animal Industry and Fisheries (MAAIF) through its Commissioner Animal Health (CAH) / Chief Veterinary Officer (CVO)is mandated or obliged through government policy, strategies and a laws / regulations to protect animals against unnecessary pain and suffering The policy, legal framework, financing and technical logistical supplies are limited especially in ensuring animal welfarewhich by law is one of the public good services and mandatory in delivery. available and ethically as their first duty to protectanimals against unnecessary pain and sufferingmeted by any stakeholder due to lack of awareness, ignorance and or deliberate outright abuses and cruelty to animals. The Local Government Veterinary Extension Services and the private: veterinary and para-veterinary professionals do the actual implementation on the ground at community and household level to make stakeholders aware and put in practice the expected good animal welfare requirements by providing for the 5 Fs and ensuring sustainable compliance. The National Agricultural Policy 2013 of MAAIF gives Community Based Organizations (CBO) such as the Non-Governmental Organizations (NGOs) legality /mandate to render services in the sector especially where there is a gap. Animal welfare is certainly an area which is gray and with almost no direct input by government due to heavy burden on public resources by the ever increasing range and intensity of animal epidemics / disease outbreaks. The fact that furthermore – most people do not understand exactly what animal welfare is all about and consequences of noncompliance puts the CBOs/NGOs at forefront to ensure advocacy for this area and critical outreach intervention. There is as yet no independent comprehensive study in Uganda regarding the state of animal welfare /animal wellbeing and compassion in animals. However, aspects of the F5s especially animal health which is the ultimate gauge and indicator of animal welfare have been studied. Animal disease cases and thus prevalence increased over the last 16 years during the policy reform period including the decentralization. Figure 4&5 show sustained Foot and Mouth Disease outbreaks in the cattle corridor and non-cattle corridor areas of the country (2004 -2013). It means animal welfare had been declining yearly resulting in increasing disease outbreaks and thus poor animal health. Further, some studies have indicated high levels of cruelty to animals during transportation and at slaughter where commercialization and a desire for maximum profits by traders have seen the perpetrating of cruelty and abuses in animals. This requires urgent aid for systematic: advocacy - training and outreach services in animal welfare and compassion. Another example of such brutality on animals is the recent past - cruelty in donkeys in which massive numbers of these very few but essential working animals (silent dedicated unpaid workers) were slaughtered putting the donkey survival, welfare and the poor household livelihoods at stake . Stray and or street animals especially pets such as dogs and some ruminants continue to increase with inadequate viable compassionate or kind related alleviation strategies putting animals and man at health risks from RABIES and animals – man – vehicles at traffic accident risks. These animals also destroy property and make places of stay unhygienic . We cater for all animal species. !